Does Google’s algo devalue sites that are ugly or with poor usability? Are there any direct or indirect links between this and a site’s rankings on Google? We do know that usability and site perception plays a large role in the Google Quality Rater Guidelines. Raters are specifically asked to look at how easy to use and essentially how nice and trustworthy a site looks. But these kinds of things are harder to translate into something in the algo, since while Google is rendering a site, it wouldn’t be as easy for a bot to judge usability outside of specific parameters – such as the page layout algo which demotes sites that are ad heavy at the top of the page, or mobile friendliness. Of course, a site has issues such as poor usability or a design that is badly done will tend to get fewer links and other recommendations, such as social media shares. And often, these sites get fewer pages per session, especially when the site makes it difficult to get to other content on the page. The question came up in a recent Google Webmaster Office Hours and John Mueller discussed the indirect ranking impact some of these issues have. How likely is an ugly or difficult to use site, how likely that could cause ranking issues, so that’s an interesting question. I think for the most part, this is something where you’re more likely to see indirect effects in the sense that when users go to your web pages and they really don’t know what they need to do there, then probably they won’t recommend your site to other people and then over time this indirect effect may grow in the sense that we don’t see a lot of signals that are like positive for this site. In a perfect world, all sites would look professional for their market area and be easy to use, but this is often not the case. 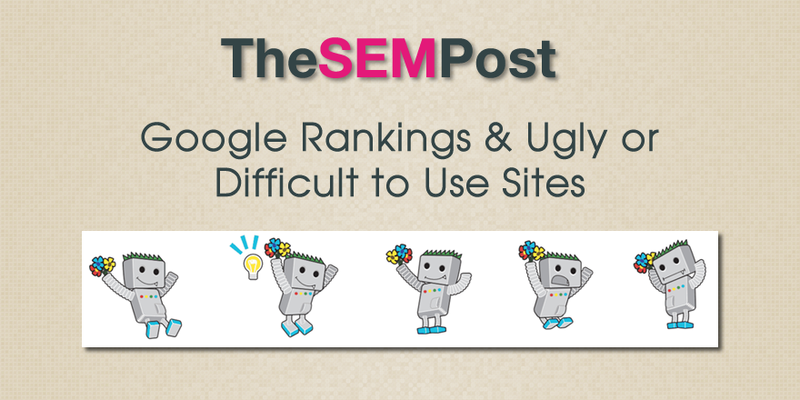 And while Google might not devalue your site specifically for these reasons of poor usability and ugliness (although Quality Raters do rate these sites poorly), it makes a lot of sense for site owners to fix these types of reasons, not just for Google reasons, but for the site’s visitors. If visitors don’t like your site because it is hard to use, then they will go to your competitors instead, regardless of how well Google ranks – or doesn’t rank – the site.